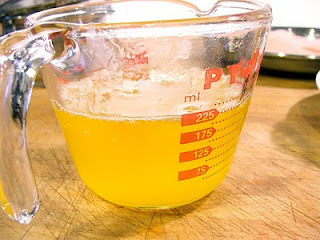 I woke up this morning to make myself an egg over easy, and found that my supply of clarified butter was almost empty. I use butter that I clarified to reduce the burning of regular butter when used in a pan. Making clarified butter is one thing that you should try to do at least once every two to three months. There is nothing better than being able to cook at a higher heat without burning your food before in goes into the pan. Clarified Butter should not be confused with Ghee. Ghee is the term used in India for clarifing butter at a higher heat. In India, Ghee starts out the same but ends with a different taste and color even though most people often confuse the two. You will need about a pound of butter. I recommend unsalted butter over salted, since we are removing the milk solids and water, the salt just becomes one of those added things that will just be tossed out. Next place the butter in a good stainless sauce pan and set to medium heat. Do not use a pan with a non-stick coating, as this can flake off and contaminate your finished product. After about 3-4 min you will see that the butter has melted and is starting to boil. You do not want a hard boil, but a med boil. Let it boil until the sounds of pinging from the water and solids in the butter have dissipated. You will find that a most of the milk solids have sunk to the bottom of the pan and some of the lighter solids have floated to the top. Skim off the foam with a spoon. Take off the heat and let cool for about 2-3 min. Using a fine mesh strainer, gently pour off the contents into a heat proof container with a air tight lid. Refrigerate and it will hold for about two to three months. Kept on the counter, it will keep for about a month. For Ghee, Ghee is done when a second foam forms on top of butter, and the butter turns light golden brown and has a nutty aroma. It should take approximately 7 to 8 minutes. Be sure to watch carefully so you don't over cook the butter and it over browns. Brown milk solids will be in bottom of pan. Use the same process as clarified butter to store. Clarified butter is rich, and can be used where you don't want a flavor other than the flavor of butter. Ghee has a caramelized buttery nutty taste and is useful for a lot of foods where high heat is used.